In first place, the mighty force that is Great Britain. In second, also-rans Russia. A description that could fit track cycling or rowing. But gymnastics? Britain's men beat Russia at the weekend. They beat everyone else, too - Romania, Germany and France among them - to be crowned European team champions for the first time. 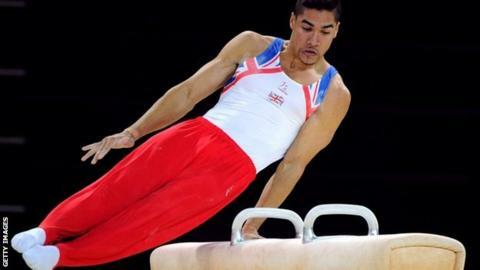 But Russia stands out for Louis Smith, captain of the British team. "When I was a junior, the senior team were coming 15th or 16th," recalls Smith, who won European pommel horse silver on Sunday. "The Soviet Union, when they were together, was untouchable. For the GB seniors and juniors to be able to beat Russia and Germany and be on top is unbelievable." Nations like Russia and Romania are still associated with Soviet and Eastern Bloc dominance of artistic gymnastics, spawning legends like Vitaly Scherbo and Nadia Comaneci. However, two things have happened in the past decade. Reality has bitten in Russia and Romania as funds are diverted elsewhere, while Britain has enjoyed a revolution on the back of a home Olympics and success at Beijing 2008. "The programme has come a long, long way in a relatively short period of time," says performance director Tim Jones. "But we're realistic enough to know that while our progress has been good, other nations have been in decline - either because they don't have such a talented crop of gymnasts, or the same financial support, or there has been a cultural change which means they can't enforce the systems which made them successful in the past, for example in Romania." While older empires crumble, Britain's new order is driven by two events in 2008. The obvious one is Smith's pommel horse bronze medal in Beijing, Britain's first artistic gymnastics Olympic medal for 80 years and a catalyst for funding, exposure and inspiration. The second, earlier that year, is far less trumpeted: the British juniors won the European title for the first time, beating Russia. Yet as GB junior coach Barry Collie explains, the Russians had a hand in their own demise. "Russian coaches were very much involved with the British team," says Collie. "Now it's predominantly British guys coaching, but they learnt a lot and were hugely influenced by the Russians. They have had a huge input on how we teach our young gymnasts. "In the last 10 years our juniors have become the best in Europe and started to challenge China and Japan, who are coming over to watch how we train and what we're doing." Building on 2008's results, Britain's juniors won the European team title in 2010 - Russia were absent, the Icelandic ash cloud preventing their travel to Birmingham - and defended it last week, with Russia second. Jones says: "When we look at some of the success we've got now, it's very clear that the 2008 European junior results were incredibly important for us. A lot of that team are the mainstay of our team now. "Then there were good results in Birmingham two years ago, and some of that team are now making the transition into our senior team, such as Sam Oldham and Max Whitlock. We expect some of the boys in our junior team here will be people we'll see in 2016 and 2020. "But while it's good to have great junior results, what we really need from a junior programme is that they transfer themselves to be really good seniors - not the hard medals themselves." Medals do matter at senior level, and the British have been winning an increasing share, but their bubble burst six months ago: they bombed out of qualifying at the World Championships in Tokyo, finishing a lowly 10th and missing their first chance to qualify for London 2012. The team made sure of their Olympic places with an assured performance at January's Olympic test event inside the O2 Arena, snatching their second opportunity, having looked oddly vulnerable and out of their depth in Japan. "That Tokyo result was a statistical anomaly, a really disappointing one for us," recalls Jones. "Otherwise, the progress over these four years has been consistent and steady, and the results from this week have been no fluke at all. "In hindsight, it was fantastic that finishing 10th in Tokyo meant we had to compete in the London Olympic arena and get that real buzz from a home crowd." In two months' time, back in front of that crowd, sights are set higher than ever. Smith and his team-mates are now dark horses for an Olympic team medal; he is the team's leading individual medal hope on the pommel horse, while Dan Purvis or Dan Keatings may be expected to challenge for all-around honours. Having won one Olympic medal in the last century, Britain's men could feasibly get two in a week. Collie and his juniors have a tougher long-term task: turning whatever success comes this summer into a dynasty. "There's now a belief, because of Louis and Beth [Tweddle, Britain's leading female gymnast], that we can do this," says Collie. "The kids are motivated and inspired, but the most challenging thing is keeping them in the sport. We're not like football, it's not highly televised. But we're getting there. "My challenge for Rio 2016 is to get some of these junior kids on that team - and beating some of these seniors."